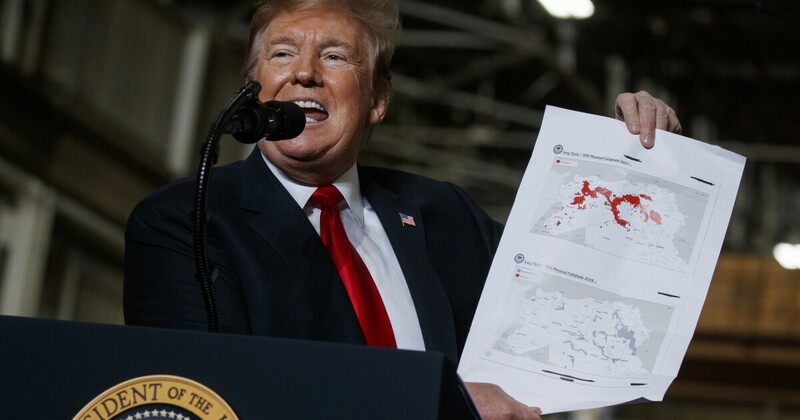 F ox News declared Thursday the Islamic state of caliphate has fallen, one day after President Trump said the terrorist organization would be wiped out overnight. "The caliphate has crumbled and the final offensive is over. While the official announcement has not yet been made – Fox News has been told that this village, the last ISIS stronghold, has been liberated," Foreign Minister correspondent Benjamin Hall reported who said Fox News was present in the five days of fighting and noted troops pulled down the ISIS flag in Baghouz, Syria. The Pentagon has not confirmed the report. Pentagon spokesman Charlie Summers told reporters on Thursday that the offensive against ISIS is ongoing. "They continue to pursue ISIS, and it ensures that we eliminate their ability to reform. The size of their territory is smaller and smaller and smaller," he said. Fox News reported that a Pentagon announcement is expected soon. Over the past week, the Kurdish-led Syrian democratic forces have been involved in a military operation celebrating throughout the east of Syria, fighting through villages and small enclaves to extract the remaining ISIS warriors in the region. 6 and another with a "little spot that will be gone tonight." He later tweeted the cards with the message: "ISIS calibrates two years ago in red versus ISIS caliphate today. (Worse still in November 2016 before I joined)."